The Accent Problem in Turkish. BASKAKOV, A. H., GOLUBEVA, N. P. et al. 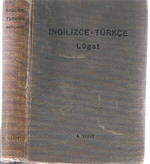 An English and Turkish Dictionary. Pronouncing and Explanatory.